As the name suggests the twin towered Paradise Centre apartments is literally in the heart of Surfers and as well as its central location, the resort offers every conceivable comfort. Enjoy Pacific Ocean views from the resort's recreation deck on level six as you laze by the pools and spas or burn up some energy on the tennis courts or in the gym. With a bridge overpass to the beach close by, complementary barbecue facilities, expansive lawn areas and two children's pools, this resort really is the perfect family holiday environment. Couples seeking a more relaxed itinerary can take in views and cool sea breezes from their private balcony or venture out to explore the myriad shopping malls, or culinary options. 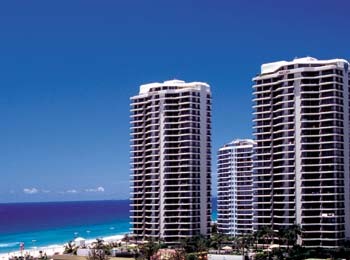 Offering a range of one, two and three bedroom fully self contained, air conditioned apartments, Paradise Centre apartments provides spacious accommodation right in the heart of Surfers Paradise. Available with 1 double bed. Available with 1 queen + 2 single beds. Available with 1 queen + 4 single beds. Also features a wrap-around balcony. Located just 20 metres from the beach and right in the heart of Surfers Paradise, Paradise Centre apartments provides a number of activities and entertainment options right at its doorstep. Enjoy the resorts facilities or head into Cavill Avenue for an action packed day filled with shopping, dining and beachside markets. 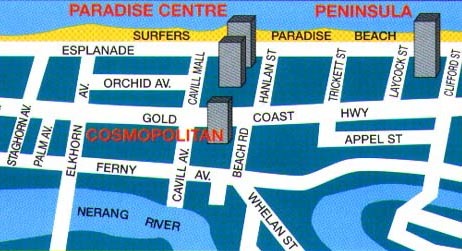 Hanlan St., Surfers Paradise, Queensland. 4217 Australia.